It will surprise no-one that the release of Beowulf: A Translation and Commentary has got a lot of attention towards the end of this month, but unlike earlier, I will here focus only on the few pieces that have provided interesting perspectives for me (whether I agree or not). I have not yet found the time to sit down and read through Tolkien's book. 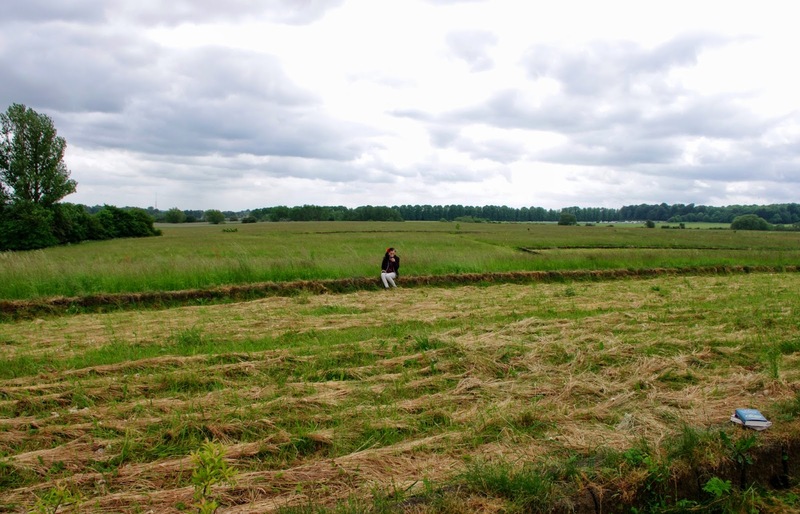 I did take it on an excursion, though, going to the historical site of the kings' mead-halls in Lejre, and there read for my daughter Tolkien's translation of the approach of Beowulf and his men to this particular site. A fine afternoon that was. A preview, really — one gets the impression that Gilsdorf has not had an advance copy to read and is reporting on the fuss about the upcoming release rather than on the book itself. I cannot help but think that the basis of the comparison of Tolkien's and Heaney's Beowulf translations is fundamentally flawed. The two translations have completely different purposes, making them essentially incomparable. Still, the review is certainly interesting even if one finds the comparison irrelevant. Another review that primarily looks at the translation as intended as a work of art to attract and captivate a reader, but while I agree that this perspective is also relevant, I do not think that it is reasonable to make it the primary perspective since this was evidently not Tolkien's primary purpose in making the translation. Jamie Portman has spoken with HarperCollins' publisher of Tolkien's Beowulf, David Brawn, who offers some other perspectives. At one point Brawn is cited for saying (about Sellic Spell) that ‘It was the sort of thing he enjoyed doing - creating something in the form in which it might have existed had it been written a thousand years ago.’ It seems that the ideas first suggested, as far as I know, Tom Shippey, about Tolkien's work as asterisk-myths and ‘writing into the gap’ are now accepted as truth (not surprisingly, and I fully agree with it, by the way). Overall this is a fairly sober review that focuses on the Beowulf translation, as well as on ‘Sellic Spell’ and the two poems. In comments on the translation itself, Tish Wells writes that ‘What comes through clearly in Tolkien’s translation is a reflection of a time and a culture.’ This seems in many ways to echo well with the position of Deborah Higgens in her recent book, Anglo-Saxon Community in J.R.R. Tolkien’s The Lord of the Rings. Even without anything else, this would be worth it just for the opening: ‘The long Hwaet! is over’ (yes, I like my puns raw and unpolished) :-) Fortunately for others with a different taste in puns, there is also other aspects to commend this review — primarily the discussion of Tolkien's deep understanding of the culture of the Old English poem: both the culture described in the poem and the culture in which it was composed. ‘Some quick thoughts’ according to Michael Drout himself, but clearly of great value to the rest of us. Obviously his praise of Tolkien's alliterative translation of Beowulf (some 600 lines according to Drout) leaves us yearning even more for this additional bit, wondering why it was not included in the present volume. Kiernan's criticism of the decision to publish Tolkien's Beowulf translation has in some ways come to stand as the exponent of this criticism. Though I, obviously, do not agree with the conclusion, I have to say that some of the reviews that I have seen makes me more appreciative of the concerns. Where Kiernan is wrong is, I believe, in two issues: first of all, Tolkien's criticism of his own work should always be taken with a grain of salt (and sometimes with a pound of salt), and the fact that he had his son, Christopher Tolkien, type out his manuscript translation some fifteen years after completing the initial version also shows that it was not a work that he merely put in a drawer and tried to forget. Secondly, despite the reviews that seem to contradict this, I think that most readers of this book will be able to discern that Tolkien's purpose with this translation was different from e.g. Heaney's — after all, most of the reviewers seem to grasp this fact quite well. Another review and commentary by a man who is himself a scholar of Beowulf (and has published a translation). Alexander is more appreciative of the work than Kiernan, but he also states that ‘The felicities of Tolkien's version will be evident only to readers familiar with the Anglo-Saxon original.’ I hope that this is not true, though perhaps the rest of us will have to work a bit at fully grasping these felicities. Unsurprisingly, Tolkien scholar and biographer John Garth adds new perspectives on the new book. John Garth's review has a focus on what this book tells us about Tolkien as a man, and about that particular Beowulf part of the leaf-mould from which so many fantastic tales grew. mead-halls are marked by turf banks in the terrain. The News aggregation on the new Tolkien Society web-site is a great place to watch — I am seriously considering to not mention anything that has appeared there unless I have something extra to say about it. An animation master class project that is also a tribute to Tolkien's work. Beautifully done! In more than one way, I actually think that this style is more appropriate for Tolkien's work than what we have otherwise seen. Telling the story of the animation above — and of the reception. On the sixth Omentielva conference, which will be held next year, 6-9 August 2015, at the Greisinger Museum in Jenins, Switzerland. Much has been made of the upcoming publication of this audio recording of Tolkien from his 1958 trip to Rotterdam. It IS exciting and interesting, but I wish that we could have been spared the hype of this ‘true meaning’ idiotic nonsense. Either this true meaning is the same as Rossenberg reported in his paper for the Centenary Conference (thanks to Janet Brennan Croft for drawing my attention to this) (i.e. ‘nothing at all’), or we have Tolkien purporting two different versions on the same evening of the ‘true meaning’ of his work. The latter should, of course, not surprise anyone — Tolkien was never consistent in his analysis of his own work, and there is no reason to put one version above any other. Still, I nonetheless look forward to being able to hear this recording, but not because I believe I'll learn anyting new about the ‘true meaning of _The Lord of the Rings_’. ‘Approaches to paganism and uses of the pre-Christian past in Geoffrey of Monmouth and Snorri Sturluson" (5 May) — I trust that the relation of the topic in the headline to the Beowulf poet, and perhaps particularly Tolkien's discussion of the Beowulf poet, is not lost on my readers. ‘J.R.R. Tolkien's Beowulf published today" (22 May) — not so much a review, but a collection of a few reactions, mostly from medievalists. ‘Edward I and the Appropriation of Arthurian Legend" (26 May) — As it says in the abstract, this follows in a tradition of " increasing interest in the appropriation of folklore by political leaders [that] has led scholars to investigate potential instances where this may have occurred in the past." Report on the Tolkien tracks at the April conference by the Popular Culture Association / American Culture Association. Anna Smol's report highlights two particular sessions, a round-table on the state of scholarship on Tolkien and another round-table (in which Anna Smol participated herself) on the Tolkien collection at the Marquette University Archives. I haven't been through all these to check which ones report on the Tolkien sessions, but there's a long list here, and even if not Tolkien, most of these reports etc. will surely be interesting. The Southampton Tolkien Reading Group is currently reading and discussing Unfinished Tales and in May they have discussed the Narn i Hîn Húrin — follow these blogs to find valuable insights into this work. A very interesting commentary on Tolkien and the idea of the just war. This certainly manages to make me interested in the book Jonathan Witt is writing with Jay Richards. There are some good thoughts here that rhyme well with what scholars are saying elsewhere about Tolkien's ability to immerse himself in medieval (and particularly in Anglo-Saxon) thought. When we remember what Tolkien himself says about the importance of languge in the thoughts and tales of a culture, it is not surprising that he would easily slip into the idiom, vocabulary and structure of the thinking he was trying to portray (as also indicated by the draft letter Martinez quotes from in length). Some thoughts on the matter of Orkish redemption, and more specifically, on Orkish repentance. Charlton posits that the Orcs were not immanently incapable of repentance, but that the lack of repentance was a simple fact of history. Since there is no reference to which Orcs Charlton is considering (that is, from what period of Tolkien's conceptualisation), it is difficult to comment precisely. Tolkien's various comments in various texts related to the second phase of the later Quenta Silmarillion (roughly 1958-62 if I take a very broad view including certain letters) make it clear that Tolkien, at that point, did consider Orcs to be incapable of repentance by their innate nature, and of course the whole question is void for the Orcs as he saw them until some point in the mid-forties. All in all, I think the solution is attractive, but that Tolkien's writings suggest that Tolkien took a different route. I do hope that Charlton himself sees the irony of his claim that people that he disagrees with politically are (almost) like Orcs in this respect. By Marcel Aubron-Bülles on quoting Tolkien on the 'net — yes please! Thank you, Marcel. It is, as far as I can find, unfortunately not possible to get a sorting of new posts for a specific month on Pieter Collier's Tolkien Library site, but May 2014 has some interesting posts about the 2015 Tolkien calendar (featuring art by Mary Fairburn), a Tolkien art book, and the release of Tolkien's Beowulf, and the upcoming 60th anniversary edition. Also a couple of articles by other authors (by James Lopez and Simon J. Cook). The Swedish Tolkienseminariet continues the series of highly worthwhile reviews of new Tolkien literature — a must read for anyone capable of reading Swedish! On the Tolkien Beowulf, the new on-line Journal of Tolkien Research (also see my transactions for March 2014) and on the paperback release of Tolkien on Fairy-stories. The cover for their upcoming edition of The adventures of Tom Bombadil. A short review in The Guardian's children's review section, where children post reviews for other children. A review by Christina Scull of Angela P. Nicholas' book on Aragorn, Aragorn: J.R.R. Tolkien’s Undervalued Hero. There is little to say — the review is very positive and Faramir's comment about the praise from the praiseworthy struck me forcefully. The book has immediately been bumped up considerably on my wish-list. As noted in my last issue, I seemed to have missed some things due to a feature in my RSS reader. 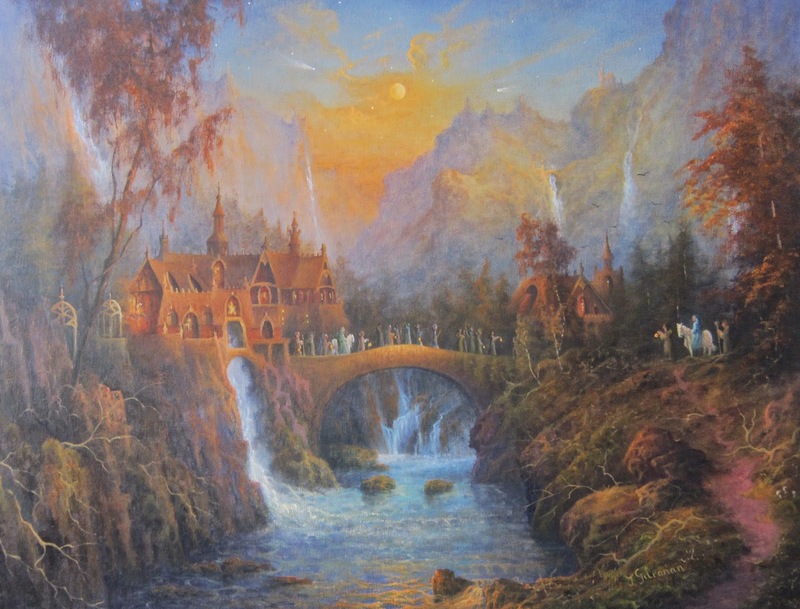 This wonderful picture of Elves leaving Rivendell (for the Grey Havens and Tol Eresseä, surely) was among those I missed, but I now try to make amends. 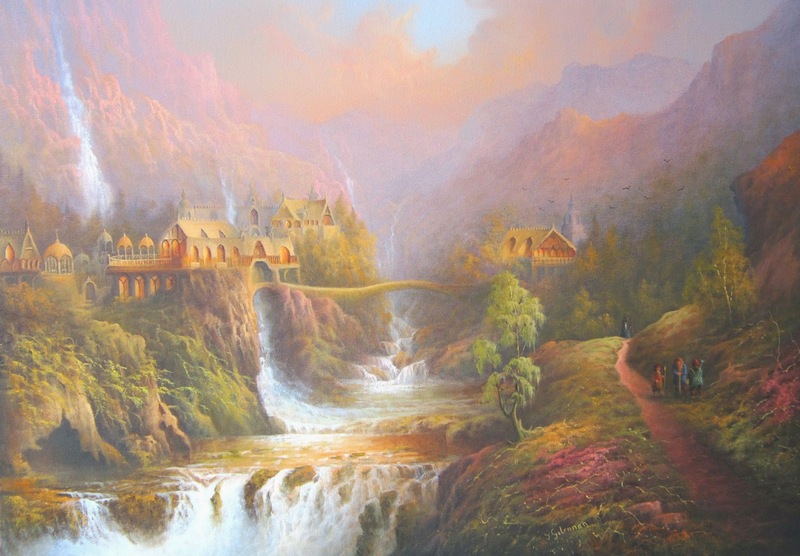 The work in question being a very nice picture of Rivendell with the Last Homely House. 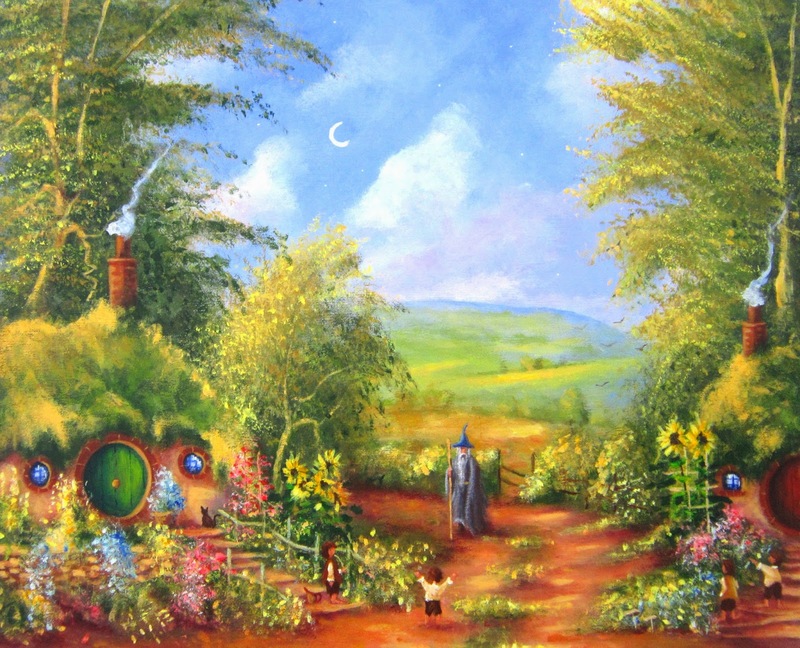 Gandalf arriving in The Shire. A call for papers for this converence to take place in November in Porto in celebration of the the 60th anniversary of LotR. Three walks through Staffordshire with a focus on places linked to Tolkien, who lived in Staffordshire with Edith when Tolkien was stationed in England during the Great War. 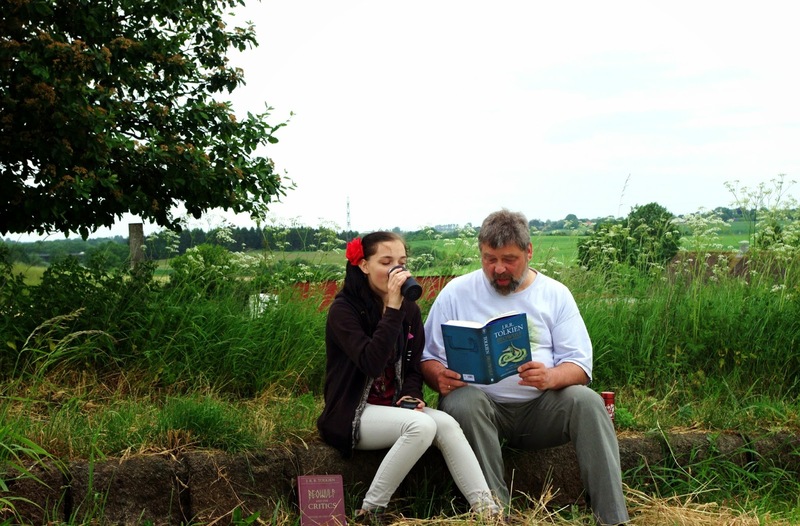 The first walk goes from Penkridge Library over Gypsy Green to Brocton Camp on Thursday, 3rd of July. A walk of Cannock Chase starting out from Brocton Coppice on Thursday, 18th September. The last walk goes from Brocton Coppice to Great Haywood with a tour of Great Haywood on Tuesday, 7th October. Announcing a presentation by Tolkien linguistics scholar, Arden R. Smith of the Elvish Linguistc Fellowship. The presentation will take place on Tuesday, 24th June, in San Francisco, and if anyone is in the area to hear it and write about it, I'd be grateful. The idea is brilliant, but I have to admit that I find it somewhat odd to stop the whole thing at the end of chapter 3 of book VI and forget about the substantial travelling done in the last six chapters. I know that Fonstad only includes pathway tables for that part in her Atlas of Tolkien's Middle-earth, but it is not particularly difficult to estimate the last bits, particularly since Fonstad does include a map of ‘The Road Home’ giving her best estimate of the route that was taken. The URL is, unfortunately, not going to help you unless you are a member of the Tolkien Society Facebook Group. The Thread is, as one poster described it, a collection of highly concentrated whimsy. As of writing (9 June) the Thread is up to 4721 comments — it's good fun, and though the posting frequency is decreasing, I do not doubt that we'll hit the 5000 mark before too long. MB, Monday, 14 April 2014, "A History of ‘The One Thread up’ until commentary 2,533." But you should in any case be able to enjoy the summary that Marcel did. Of course it only covers the first 2533 posts of the Thread, but it gives a good impression of what the Thread is. I've just reduced the list to those who have posted in May (whether Tolkien-related or not), without giving details on posts not discussed above.